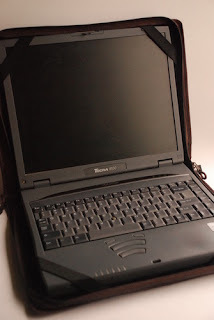 My laptop is my life, and I would never want anything bad to happen to my baby. That's why I use a special protective sleeve my aunt made for my laptop. It's getting quite worn out, though, which is why I've been on the lookout for a new sleeve that wouldn't sacrifice my style -- or budget. I recently heard about Punchdrunk Panda, and when I checked out their site, I knew I found The Ones! 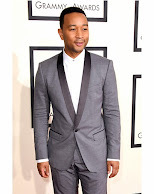 That was not a typo -- I couldn't choose from the wide variety of ultrachic designs! 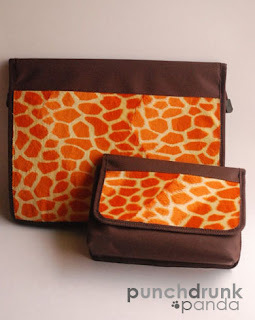 I love the orange and brown combination on these giraffe print and brown polycanvas sleeve and accessory bag. 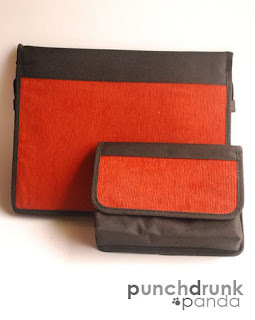 It adds just enough punch to raise your laptop bodyguard's cool factor. Make a bold statement with rust corduroy and black. Very hot. You know I can't resist anything that's black and white. 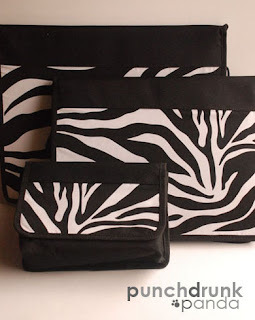 I love the classy-slash-funky look of the zebra print and black polycanvas. 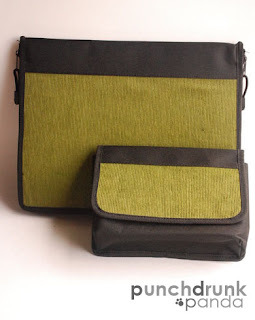 In the photo are the accessory bag with the small and medium-sized laptop sleeves. They all come with a free accessory bag for your charger and other laptop accessories. For more information and photos of other cool designs, check out Punchdrunk Panda's site. There are limited stocks for each design, so you better place your orders on your picks right away. Get your baby strapped in now!